Vice President, Professor Yemi Osinbajo on Sunday said Nigeria cannot afford to allow looters and corrupt elements to return to power, urging electorates to vote massively on February 16 for consolidation of the rebuilding process being championed by the administration of President Muhammadu Buhari. Speaking during a courtesy visit to the Oloja of Epe, Oba Kamorudeen Animashaun as part of the next level engagement to the ancient town, Osinbajo said Nigerians should not be deceived by the very people who looted the country dry and now seeking to return to power. He said several initiatives being implemented by the All Progressives Congress (APC) government to create jobs such as N-Power, TraderMoni and Markey Money, among others, as well as provision of critical infrastructure were prevented in the past due to corruption, and that it was important to let Nigerians know that the forthcoming polls should be about voting for continuation of the dividends of democracy. According to him, “At the next level government, aside from all these initiatives, we also want to establish Entrepreneur Bank and Peoples Money Bank to complement the Bank of Industry. What we have realized is that we need to create several avenues for people to access funds to set up their businesses, and thereby create opportunities for more jobs. Already, we are in partnership with the Africa Development Bank (AFDB) to invest $500 million in creating jobs. “All these things out to have been done before now, but corruption has prevented us from enjoying these things. We are at a point that we need to tell ourselves the truth because the country ought to have moved far ahead of where we are. If the leaders are corrupt, there is nothing that can move. It is not as if there is no idea to move this country forward. As a matter of fact, there are several ideas but corruption has refused to allow these ideas to come into fruition. While commending Governor Akinwunmi Ambode for the massive infrastructural renewal embarked upon by his administration in the Epe division, the Vice President assured that serious attention would be given to remaining roads connecting Lagos to Ogun State to facilitate ease of movement and boost commerce. “I have to thank our Governor, Mr Akinwunmi Ambode who has shown a pattern of serious hard work. I have been here a couple of times with the Governor to see the infrastructural renewal ongoing here and I have to thank God for helping him to achieve this much for Epe. “There is nothing we see here that is not good. 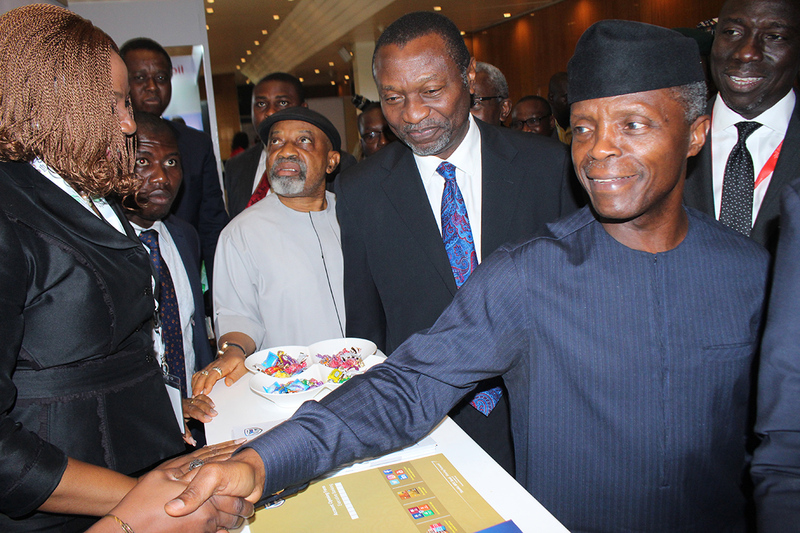 Every of his project here is good and commendable,” Osinbajo said. Also speaking, Governor Ambode, who embarked on door-to-door campaign with the VP in Epe, urged residents to troop out on election day and vote massively for all APC candidates. “You know where my heart is. For me, it is four plus four. So, on February 16, it shall be APC all the way from Presidency to Senate and House of Representatives. “Whatever you want to do because of me, just know that it is APC all the way from top to bottom,” Governor Ambode said. Photo News : Exclusive Pictures From OJB Jazreel’s Burial. Ambode Inaugurates Community Sport Centre, Lauds NBC/Coca-Cola.